The first Uganda installation is coming along nicely (though we’re experiencing typical delays, materials sourcing issues, etc.). 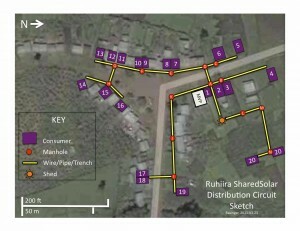 Below is a quick sketch of the distribution system. Contractor negotiations (to drive down cost & save time) have been resulting in daily changes to this system. This drawing is two days old and already out-of-date. Life moves fast (or slow depending on your perspective). Much of the last week has been focused on this distribution system. In the interest of getting a robust system in place quickly, that we can learn from, we have not optimized the cost of this system. 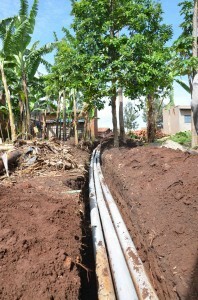 Below are pictures of the piping containing the wires (before the pipes were buried). Though this week we’ve been focusing mainly on the AC side of the system, the batteries were stacked so as to make enough space in the shed for working on the meter this weekend. 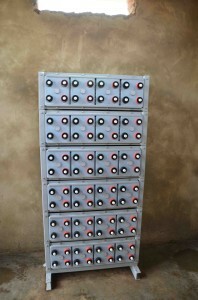 (Too bad the batteries were stacked incorrectly, meaning re-situating each of the 6, 100kg modules!) Next week we’ll be wiring up the DC side of the system! 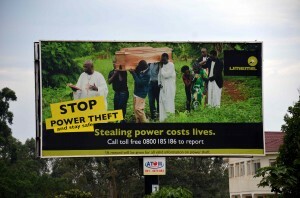 Every day on our drive to this pilot site in Ruhiira we pass two billboards as we leave Mbarara. The first shows the dangers of stealing electricity! (SharedSolar should decrease a consumer’s ability to steal electricity, because of the way the “shed” is designed and the nature of pre-payment.) The second picture is an interesting take on marketing and incentives. 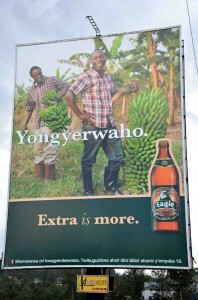 Some in some settings beer is marketed with sports cars and models, others with bananas. sharedsolar.org is my TOP1 website! Pretty great post. I actually just became aware of an individual’s blog page together with wanted that will say the fact that I’ve really enjoyed reading an individual’s blog site together with posts. Nonetheless I’ll get subscribing an individual’s provide for together with That i intend that will browse an individual’s blog site for a second time. Hello.This article was really fascinating, especially because I was browsing for thoughts on this issue last Monday.